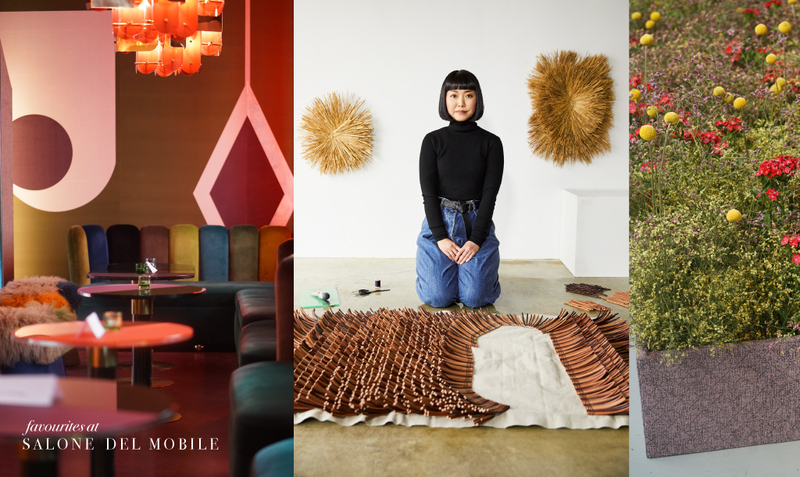 The design fare (9-14 April 2019) in Milan is known as one of the most creative hubs to collect new ideas and discover revolutionary collaborations of the world’s best designers, artists, design & fashion firms. Most fashion brands by now have a wide range of interior objects and collaborate with the players from the industry. 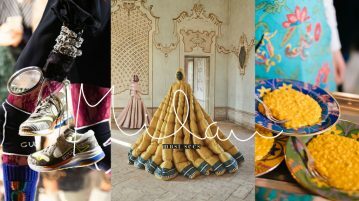 This year, Dior teamed up with the most talked about Design Duo, Emiliano Salci and Britt Moran from Dimore Milano, to create 14 exclusive creations for Dior Maison, showing at the beautiful Casa degli Atellani. Available only exclusively by special order – for a one-year period – the collection, spanning vases, trays, a candelabra, a lighter and an ashtray, place-settings, frames and an umbrella stand. DIMORE Studio also created trunk designs for the French luggage manufacture AU DÉPART, where different trunks with special purposes had been designed. 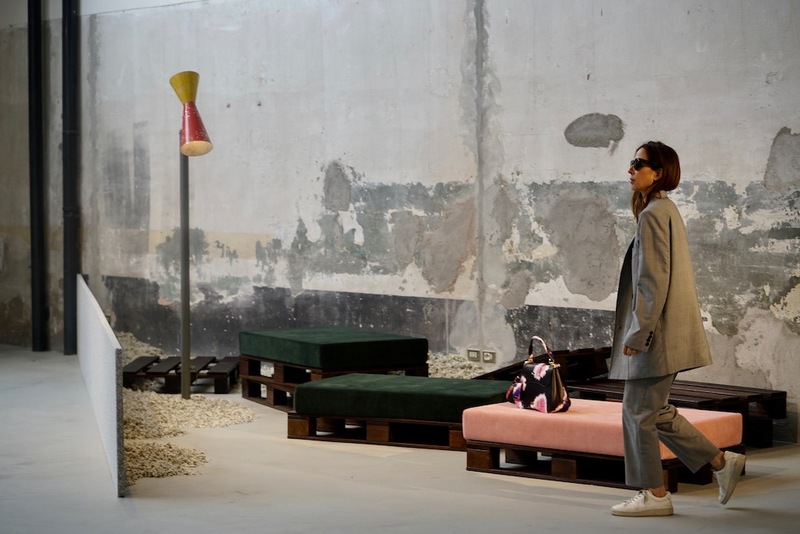 At 19 Via Santo Spirito, Alessandro Michaele designed an entire Pop Up Appartment / house for Gucci with his signature table wear, carpets, cushions, vases, wallpaper and everything else you can think of putting a Gucci label on top (Until the end of June’19). A special Gucci App has been created to augmented reality technology allowing customers to see what pieces from the Gucci Décor collection will look like in their own spaces. 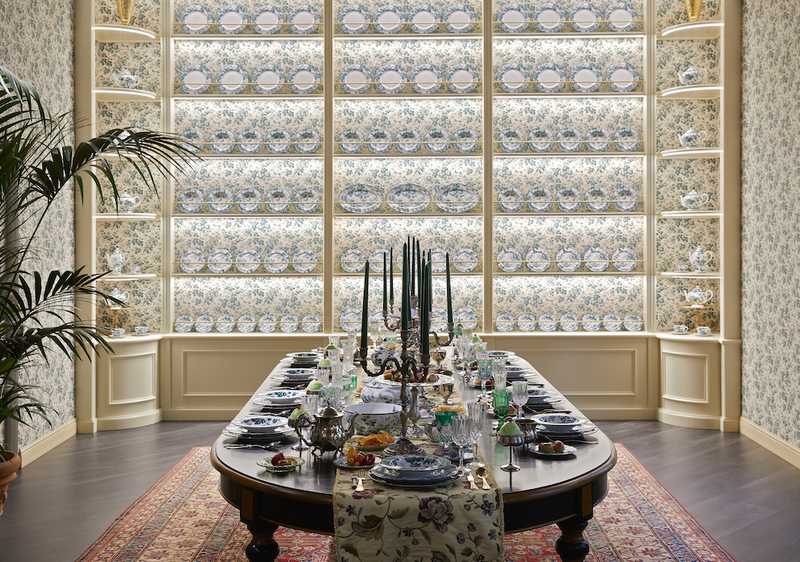 The table is set by Gucci at their Pop-UP Space at Via Santo Spirito. Everything seems possible but are the big brands afraid to work with younger, not yet known artistic talent? 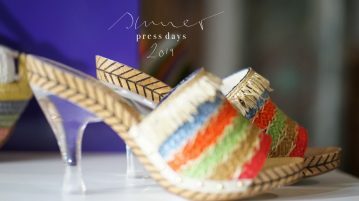 Some of them aren’t and make the Salone a unique place, like the Spanish Fashion House Loewe. Long-time known for their artisanal approach to fashion it collaborated with different artists who created a range of unique basket, handwoven bags, carpets and objects, a highlight was the Ikebana class by Watara­_Ikebana, creating something which can be a very meditative act. 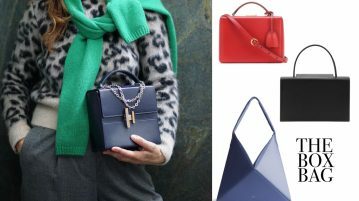 The classics like Studio Pepe, the industrial elegance of Vincenzo de Cotiis , the powder tones by Cristina Celestino and the eclectic mix by Nilufar Gallery work with what they stand and are loved for and are always surprising. The Nilufar Gallery at Via della Spiga invites you for an aperitivo in one of the most stylish bars on the first floor, designed by India Mahdavi. In the room next door with tables and chandeliers by award winning artist Bethan Laura Wood exclusively for Nilufar who loves to investigate in materials and interesting color combinations. 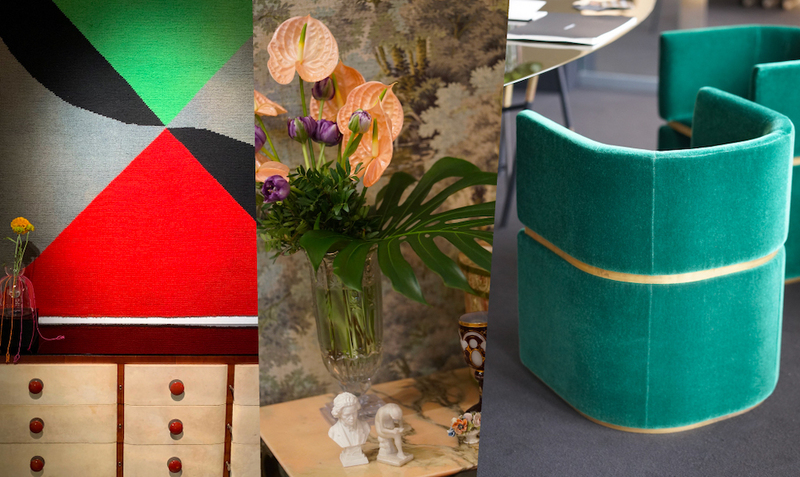 We loved to see primary colours again, wall carpet by Sonia Delaunay, 1970, hand knotted for sale at Nilufar Gallery, a flower arrangement by Gucci and armchairs designed by Dimore Studio for AU DEPART, Paris. If you head to Piazza Arcole you can get an idea of your next summer holiday with the table wear collection of the native American, JJ Martin, founder of laDouble J, known for her floral vintage pattern creation defined a style by mixing everything together, also now available in her new bed linen collection. If you rather seek the silence in living you should visit the Kvdrat, by Raf Simons exhibit at Garage 21, Raf Simons Suburban’: a vaguely dystopian neighborhood rendered in the designer’s unique vision. The installation ‘No Man’s Land’, consists of a series of prefab wood and steel structures by mid-century architect Jean Prouvé. Simons is also known for his incredible use of nature and flowers within his projects creating an entrance for the space. Jasmin wears a suit by Max Mara in a setting by Raf Simons for Kvadrat, at Garage 21. 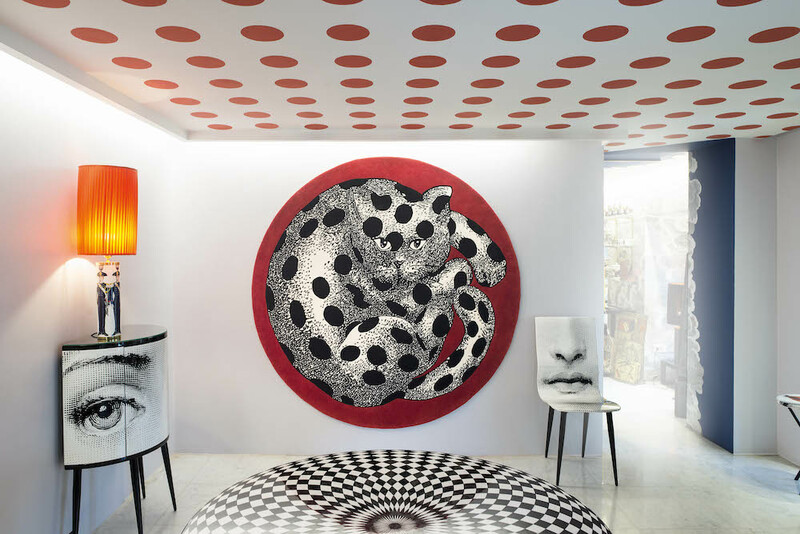 Always a classic: RUG HIGH FIDELITY at the Fornasetti store. 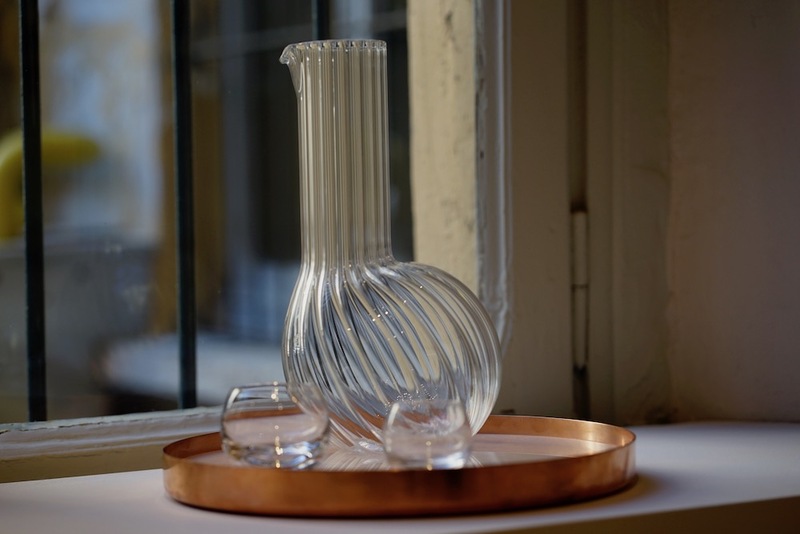 A glass carafe by Neri & Hu for the Society Collection at Via Solferino. 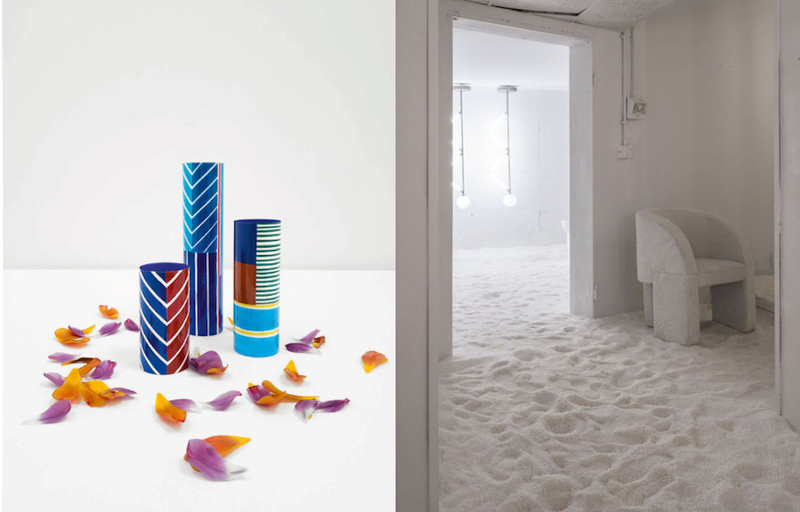 Left side selected vases by Hermes Maison, right side the installation „Les Arcanistes“ by Studio Pepe. I could go on and on but resuming for what inspired me most, are the many flower and natural work arrangements, bringing the outside indoors. 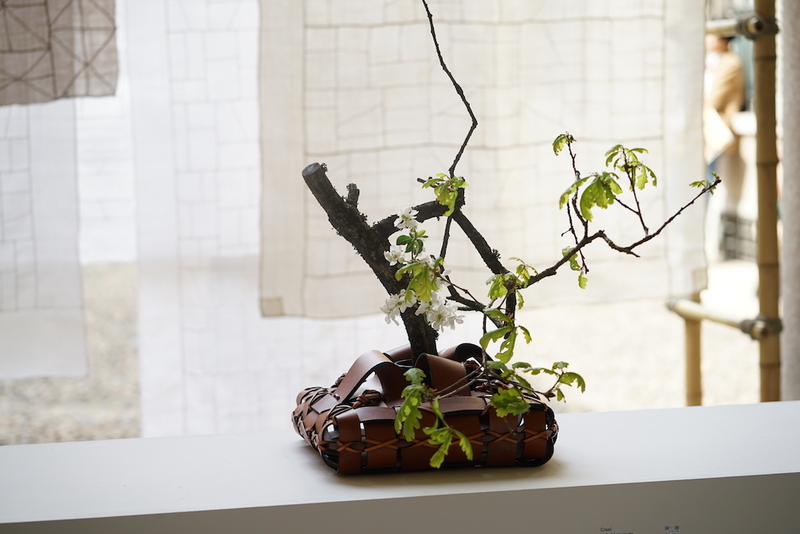 We want to be close to nature, breath in natural materials, ease the eye without falling asleep, make things light and simply beautiful but unique and will always look for the next living item that continues the journey of living and interior. The bar at the first floor at Nilufar Gallery , Via Della Spiga, 32,. Rice straw sculptures by Arko/AsakoSato for Loewe. A flower installation by Raf Simons for Kvadrat.